Alex Rivera may represent the best hope of the contemporary cinema. This year's recipient of the Jacqueline Donnet Emerging Documentary Filmmaker Award was surprised at this selection. "I've been emerging for a while now," says the 30-year-old media artist. "Part of what I do with my work is break as many of the rules of documentary as I can find by using animation, by sometimes scripting scenes, by making mockumentary as well as documentary." He is grateful and excited that his unorthodox approach to documentary technique has stimulated dialogue among both his colleagues and his audience. "I feel that it is a bold decision on [IDA's] part, and I really appreciate it." Recognition has come from many other corners. In his decade of making mainly short videos, Rivera has been a Sundance Fellow, a Rockefeller Fellow and a recipient of a Silver Hugo Award. He has participated in many mainstream film festivals, as well as screenings at the Museum of Modern Art, the Guggenheim Museum and on PBS. His latest documentary, The Sixth Section, refutes the lie among many mainstream Americans that Latin American immigrants turn their backs on their native country while making money in the United States. It was seen on P.O.V., the PBS documentary series, in September. Rivera rediscovered his Latino heritage as a creative artist, rather than drawing on his childhood experiences. His father is Peruvian, but his mother is Irish-American. "I didn't grow up speaking Spanish," Rivera recalls. "I grew up getting yelled at in Spanish by my dad. That was pretty much it. I learned Spanish as an adult." Alex's father was "really held back by his Spanish accent, which is really thick. And so he thought that if I grew up speaking Spanish, I would have the same problems, so he didn't teach me Spanish. But talk about vindication; it was kind of funny because I studied Spanish in Mexico, so I speak it with a Mexican accent now. For my dad, as a Peruvian, it's kind of his worst nightmare." 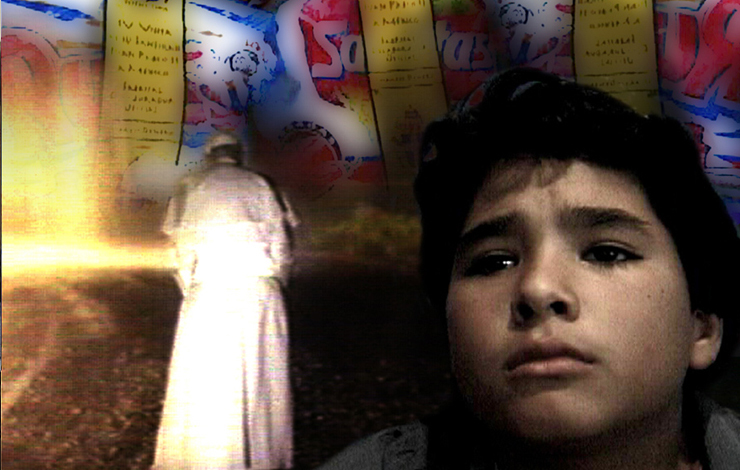 Papapapá (1995), his earliest released short video, is an homage to his father; it juxtaposed the importing of the potato into the United States from Peru with his father's emigration to the US. His other videos include Signs of the Times (1997), Mysterious Apparations on Tortillas (1997), Latinos on TV (1997), UFW March for Women's Rights (1998), Consulta Zapatista (1998), Love on the Line (1999), Las Papas del Papa (1999), Conspiracy Club for Men (2000), Fort Azteca the Bronx (2000) and The Sleep Dealer (2001). The Sixth Section can be classified as a culmination of all of these short documentary videos. Indeed, it was at Hampshire College in Amherst, Massachusetts, where he was inspired to make videos, thanks to the dynamic mentorships of media artist Norman Cowie and documentarian Ellen Spiro. Hampshire boasts a mini-constellation of filmmaking alumni, including Ken Burns, but Rivera, who calls it a perfect place to learn filmmaking, respects its interdisciplinary focus. In terms of teaching filmmaking, Hampshire insists upon each student gaining a hands-on approach to film direction, rather than pigeonholing students into crew work on some favored student's film project. "You learn how to find your voice," he says. A Hampshire undergraduate must have a dual major in order to be proficient in different disciplines. Rivera chose political science and filmmaking. "You come out with a bigger sense of the world than if you just go to film school," he says. Rivera's early films from the 1990s explored the unreality of Latino relations with a surrealistic satire that Luis Bunuel or Terry Gilliam would admire. The animation and vivid colors not only expanded the video technology at the time but created indelible images that exposed both the hypocrisy of American attitudes toward the rest of the Americas and proclaimed the fearless humanity of Latin Americans in bold ways. With The Sixth Section, he wanted to show, in the context of low wages and of being called illegal, that immigrants today are in a strange way finding power by living in two places at once. "That idea came in response to another documentary that I saw that I felt lacked something," Rivera says. "I'm drawn to inspiration, but a lot of times my creative process begins with seeing something and wanting to do it different or better." For The Sixth Section he abandoned his usual biting humor and sardonic narrator in favor of a more straightforward approach because "the story itself is so surreal that I didn't need to be playing with it or telling it in a surreal way. The content was so surprising and unbelievable." Rivera intends to retain his humor in future work. He is currently working on a science fiction film set on the US-Mexican border, sort of a " Blade Runner of the Border." One of the earliest short films, Why Cybraceros? (1997), which he describes as about "the telecommunicating migrant farm worker," was in the science fiction vein. "I don't feel a tremendous allegiance to one type of filmmaking or another," Rivera maintains. "What I feel an allegiance to is the content in trying to tell really unique versions of the immigrant and the Latino story." Rivera makes inventive use of the dissolve as a narrative device, fading out from the immigrant in Mexico to showing him in the same place on screen in an urban American setting, driving home the point that these are people who straddle two worlds. Rivera co-founded SubCine, an organization of 16 Latino filmmakers that showcases Latino films. SubCine was created to counterbalance the indifference among mainstream distributors toward Spanish-language documentaries, animation and feature films. Rivera and his colleagues "decided to take the lead of New Day Films, the collective of Socialist filmmakers formed in the 1960s. Instead of self-distributing, why not publish a catalogue together that name us as a group and self-distribute, but have a kind of central hub that takes care of the paperwork, the mailing and the billing. Basically, the 16 of us spread the word and raise the image of the catalogue. The work is all listed together in the catalogue on the web (www.subcine.com). The tapes are all in a warehouse in New Jersey at Transit Media." Transit Media arranges the shipping and the back-end work and deals directly with media purchasers from universities and colleges. "Since there's no staff and no office, and no real overhead, we filmmakers now keep 70 percent of our income, rather than the standard 40 percent," says Rivera. The University of California at Berkeley and The Latino Museum of Los Angeles bought all 30 titles in the catalog, and universities across the country have purchased selected titles. The organization has been growing because of this support and because SubCine fills what Rivera calls a void in Latino cinema. "I personally believe we are in a state of emergency in terms of Latino media. Most universities hold practically no Latino film or videos in their libraries. The gulf between the size of the Latino community right now and the representation, whether it's in the media arts and documentary filmmaking or feature filmmaking [of Latinos]—you can't describe it as anything but an emergency, if you think of media as essential to understanding the American experience." SubCine, he says, "is the only distributor focusing exclusively on US Latino work and getting it out to university buyers." "If the studios don't develop a rich and diverse Latino cinema, then I will," Rivera asserts. "Somebody has to do it, and the need is out there. In the case of The Sixth Section, the guys [in the film] I don't think would consider themselves Latinos. They consider themselves mostly attached to the small towns they left behind." Rivera focuses on the Mexican community in Newburgh, New York, but states that there are more than a thousand such communities scattered across the United States. Rivera continues: "A lot of my work has to do with changing the image of the immigrant from somebody who is seen as a backward add-on to the American experience, a kind of afterthought or an interloper, to saying in a concrete sense that immigrants are the future of this country." Rivera stops short of stating that the Latino population explosion in the US is a vindication of Latinos, particularly those Mexican immigrants whose forebears ruled in southwest America in ancient times, but says that they represent "the past and the future." He adds, "The strange vindication, if you want to call it that, is that the more that globalization and modern-day economics produce poverty in places like Mexico, the more there is migration, and the more the most forgotten people in those economic policies became a really essential part of America. The shutting down of the border has caused Mexicans and Latinos, who would normally have come to the United States as seasonal farm workers and return home, to remain in America. That is the beginning of the story of The Sixth Section." "That just speaks to the intensity from which the Latino experience is many, many experiences," Rivera continues. "We're so far behind in terms of reflecting those many, many experiences right now that people don't know where to start. What we need is 40, 50, 60 movies that are reaching out to all these different types of Latino audiences that are out there." Rivera envisions an endgame "when the United States of America will became part of the Americas, in terms of its culture and population. Its texture will look a lot more like the rest of the Americas in 50 years." Kevin Lewis is a contributing editor to International Documentary and has written for DGA Magazine and Editors Guild Magazine.